It’s almost time to pack away the thick quilts, fluffy blankets and the rest of the winter bedding because summer is just about here. Besides, you’ll be wanting to dress your nurseries and kids’ bedrooms in these beautiful new summer blankets from Uimi. 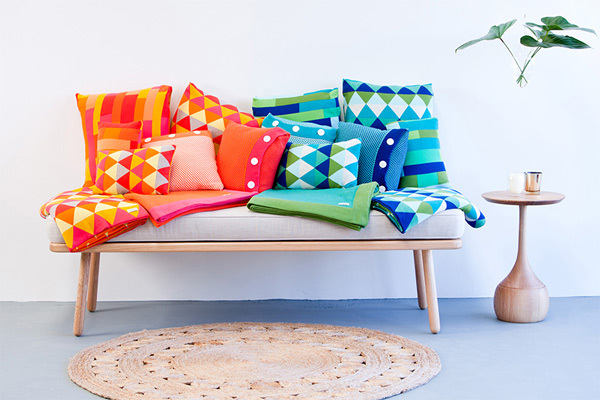 A favourite of ours since they launched three years ago, Uimi has just released their latest made-in-Melbourne bedding collection for summer 2014. 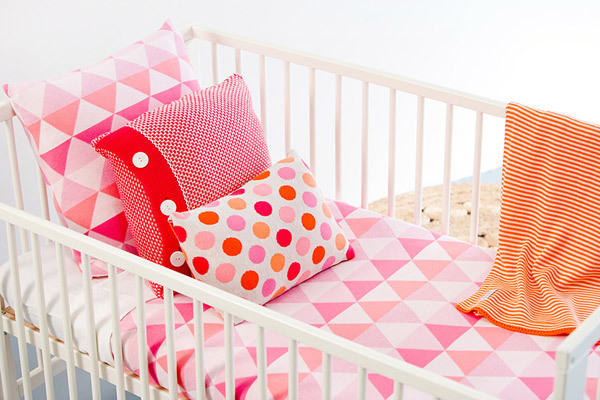 Trust me, you’ll want to take a closer look at these nursery blankets and cushions. 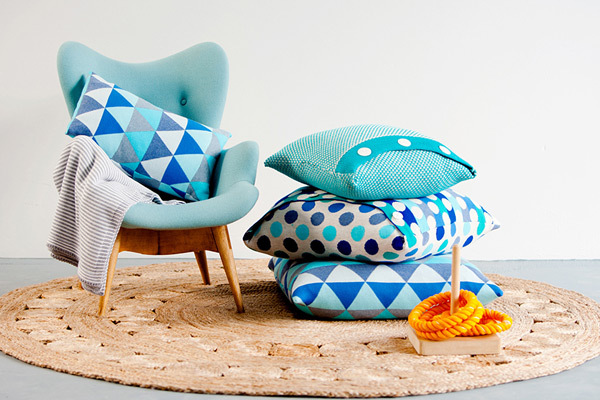 Triangles, stripes and spots mix it up for blankets that are beautiful in every way. They range in colour from the very bright to the very muted, with every conceivable combination in between. I’m glad Uimi didn’t pay attention to the old adage that blue and green should never be seen, otherwise we’d have missed out on the stunning marine version of their Indiana blanket and cushions (shown below right). 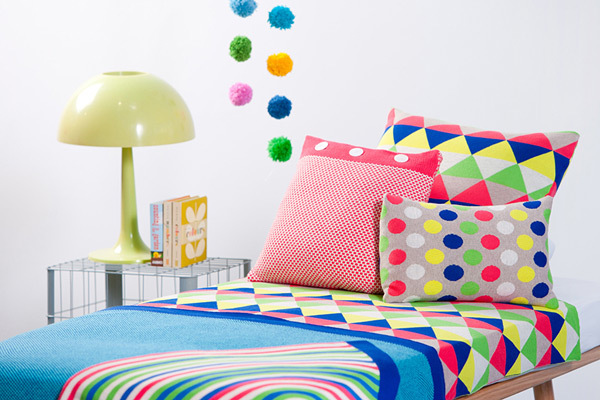 The acid version, in multi-coloured triangles or spots (as seen on the single bed above) will also wow you. The timeless stripes of the Hugo Blanket are back, with new colours (below) including grass with natural and sun with natural, and you’ll go completely, utterly mad for the Dotty Blanket, especially in its jade incarnation. All the blankets are made from organic Egyptian cotton and come in sizes to fit bassinets or cots. These also make perfect travel blankets for children of any age. Larger blankets to fit single beds are also available. You can take a closer look at the blankets in all their splendid glory at Uimi. Or head straight over to Kido Store to purchase your favourite in time for warm weather, with bassinet blankets priced from $119 and cot blankets from $129. 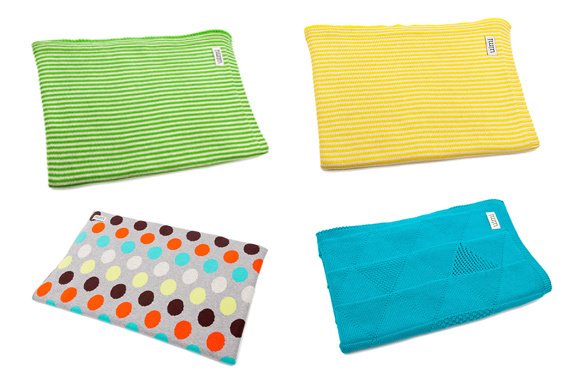 Kido Store also carry Uimi’s Merino woven blankets for cooler weather.